Penicuik Community Alliance (PCA) is celebrating the final completion of its purchase of the Storehouse building on the town’s High Street from its former landlord Scotmid. This was made possible through a grant from the Scottish Land Fund, together with more than £25,000 raised by Penicuik residents through a community share issue. 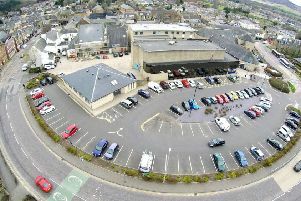 PCA now intends to press ahead with its plans to create a thriving community hub in the town centre. A grant application to help complete refurbishment of the ground floor is about to be submitted to the Lottery, and there is also potential support from the Penicuik Heritage Regeneration scheme to improve the frontage of the building. Penicuik Citizen of the Year June Horne, who organises the PCA’s weekly community meal, commented: “It’s just wonderful that we’ve been able to achieve this. PCA members were given a full update at the community benefit society’s Annual General Meeting on Tuesday in Penicuik Town Hall. The project has had a long road to get to this point, with the Storehouse project launched by PCA in December 2015, planning originally to open a community bakery, café, kitchen, food store and indoor social supermarket in the old Nickel and Dime store on the High Street.